Corinthian Classic 2014. The Pig Kahuna! Mark your calendars for the 2014 Corinthian Classic Yacht Regatta - presented by Officine Panerai - August 9 & 10 on the waters off of Marblehead, USA. 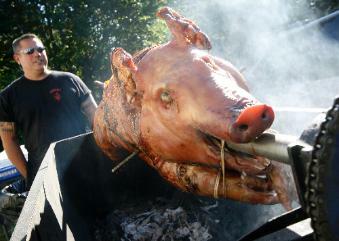 We’re going to loosen things up a bit this year on Saturday night with a pig on the spit and a band on the deck. It’s the "Pig Kahuna!” and it’s going to be F-U-N. Registration will be open soon so stand by for news.